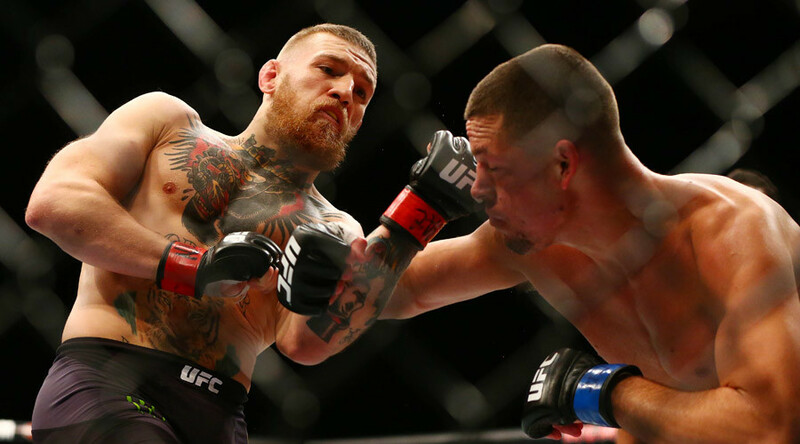 Conor McGregor has had his request for a rematch against Nate Diaz accepted, with the pair to headline UFC 200 on July 9 in Las Vegas. The outspoken Irishman has become a fighting sensation, but was brought down to earth with a thud as Diaz choked him out in the second round of their clash at UFC 196 earlier this month. It was the first loss of McGregor’s UFC career and sparked questions over his best fighting weight. The 27 year old is still the 145-pound featherweight champion after knocking out Jose Aldo in a record 13 seconds at UFC 194 in December. McGregor had been scheduled to face 155-pound lightweight champion Rafael dos Anjos at UFC 197, but his opponent pulled out due to a broken foot. Diaz stepped into the breach at short notice, with the bout taking place at 170 pounds and the American recording a shock victory. UFC President Dana White confirmed the pair would renew hostilities and headline UFC 200, with McGregor requesting that the bout take place at the higher weight division. "He was obsessed - obsessed with fighting Nate Diaz again," he said. "Obviously, Lorenzo (Fertitta, UFC CEO) and I tried to argue with him and said, 'Let's go back to 145 (pounds) and defend your title. Or if you really want the Diaz fight that bad, do it at 155 (pounds).' He wants the fight at 170. Diaz has since said he wanted his next fight to be a massive earner and his request has clearly been met. The 30-year-old Californian has also questioned McGregor’s right to a rematch, with a war of words expected in the build-up to their next clash. Aldo had requested a rematch with McGregor after being knocked out in the first round of UFC 194, but the former champion will instead face contender Frankie Edgar in an interim title fight at UFC 200. White confirmed that the winner of that clash would have their chance to take on McGregor in the future. "Win, lose or draw in this fight against Nate Diaz, (McGregor) will go in and fight either Jose or Frankie - whoever wins at UFC 200,” he said. Edgar and Aldo have met before, with the latter winning by unanimous decision when they sparred at UFC 156 in February 2013. However, former UFC lightweight champion Edgar has strung together a host of impressive wins since and seems set to push Aldo to the limit this time round. A number of other match-ups have been confirmed for UFC 200, which will be hosted at the newly built T-Mobile Arena in Las Vegas. Former heavyweight champion Cain Velasquez will jostle with Travis Browne, while welterweight Johny Hendricks will face Kelvin Gastelum. No women’s fights have been announced for UFC 200 yet, but White confirmed there would be a number on the card. "You should expect a couple. There will be a couple of women's fights at UFC 200,” he said. "Actually two, or three maybe." White would not be drawn on whether new champion Miesha Tate or former champion Ronda Rousey would be appearing, but announcements are expected in the near future.